Second novel in the “Memory, Sorrow and Thorn” series of fantasy books written by Tad Williams in 1990. The cover of The Dragonbone Chair features Simon Snowlock and the dwarfish Binabik, as well as the wolf Qantaqa (on back cover). The cover of A Game of Thrones features Jon Snow and the dwarf Tyrion, and the direwolf Ghost. 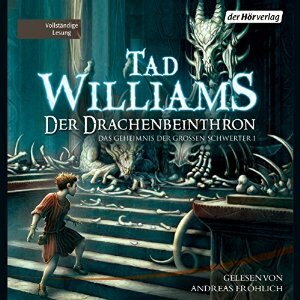 Tad’s fantasy series, The Dragonbone Chair and the rest of his famous four-book trilogy was one of the things that inspired me to write my own seven-book trilogy. I read Tad and was impressed by him, but the imitators that followed — well, fantasy got a bad rep for being very formulaic and ritual. 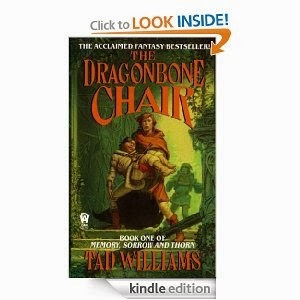 And I read The Dragonbone Chair and said, “My god, they can do something with this form,” and it’s Tad doing it. It’s one of my favorite fantasy series. 1) A high-born girl named (M)arya disguises herself as a boy, and learns to fight with a sword as she travels throughout the lands. She travels from one end of the world to the other, fleeing danger everywhere, while disguised as a boy. Despite the fact that many people see through her flimsy ‘disguise’, she keeps wearing it. 3) A red-robed advisor to the new king convinces the king that he needs to sacrifice his hated younger brother; this sacrifice, the red-robed advisor says, will make the kingdom whole once more. 4) A tailed star appears in the sky, portending doom/change. 5) Feuding brothers named Elias/Elyas and Josua appear in the story. 6) Strange, otherworldly creatures who live in the far north appear, and although they have been inactive for centuries, they plot to take over the world. They have been exiled at the northern edge of the world for many years, but will soon take it all back, manchild. 7) It is foretold of the coming of an unusual winter which will last a very long time, at the same time as the otherworldly invasion. Only the northerners take these old legends seriously. Everyone else laughs at such absurd tales. But the people of the north never forget. 8) A very unusual throne lies at the center of the human dispute for the kingdom, but it is only a distraction for the real conflict. 9) A major noble character, a close relative of the king, loses his hand. 10) A wolf character plays a major role. 11) A character that is the ‘Hand’ figures prominently. 12) A slender sword named ‘Needle’/’Naidel’ is wielded by a main character, who can’t use a heavier sword. 13) Everybody laughs at the idea of ice giants in the north… until they see them for themselves. 14) Young, noble children are cruelly thrust out into the cold, cruel world by evil adults, slowly learning to fend for themselves as they grow into young men and women. 15) A crown made to resemble antlers appears as a plot element. 16) A very short yet intelligent character has a betrothal as part of his storyline. But he is soon put on trial, where the penalty is death, and everyone seems set on killing him… even his own lover. 17) The story begins shortly before the death of the old king, whose reign was peaceful, and kept the kingdoms safe. The king brought peace and prosperity to the lands, but now his death has thrown the empire into conflict, with factions fighting. 18) The Children of the Dawn/Forest, who once lived throughout the realm, but who are now living in hiding, will have a part to play. They appear to be at odds with the otherworldly creatures in the far north. 20) A guilt-tormented knight, Sir Camaris/Ser Connington, spends years in exile in the south, only to return, where he is at last revealed as still being alive. 21) A major character lives thousands of miles from the rest of the other main characters, for over a thousand pages having no real interaction with the main group. 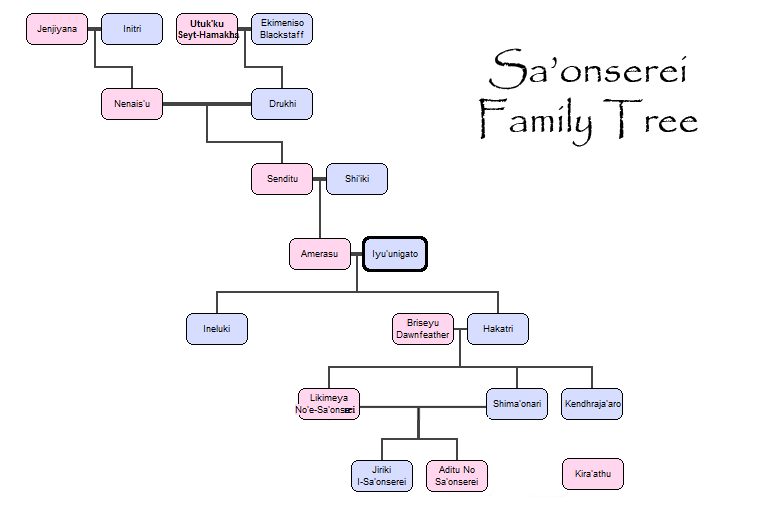 But eventually, Danaerys/Tiamak will have a role to play. 22) The series was meant to be a trilogy, but got out of hand. 23) A major young male character likes to climb his castle’s walls and turrets, and can do so with ease. Eventually, he will be forced to leave his childhood home, no longer able to climb the castle’s walls and turrets. 24) This same character is plagued by prophetic, spooky dreams. 26) A servant of evil wearing a hound’s head helmet. 28) A fierce people of nomadic grasslanders. 29) Birds are used as messengers between intellectuals. 30) A battle on a frozen lake (not yet canonical in ASoIaF but still).